Mr Burstow said this needed to change as the term residential care had become "fatally damaged" by recent scandals about abuse and neglect in homes. He said another solution to help care homes would be to offer residents "tenancy rights" when they move into the homes to give them more influence in how the homes are run. "As we are living longer lives, housing with care is going to become increasingly important in helping us stay independent, happy and healthy. "It is vital that government wake up to this reality sooner rather than later and helps create the right incentives to ensure older and disabled people have a genuine choice when they need to move." It is believed that less than 40% of land held by NHS trusts is used for hospitals and medical buildings. But the Department of Health said it was working to free up land - although admitted it was not offering the incentives the Demos report called for. Since 2010, NHS land with the capacity for more than 10,000 homes has been sold. Not all of this would have been used for housing for older people however. Health Minister Dr Dan Poulter said he felt what was being done was appropriate. "We agree that the NHS can make better use of surplus land. That is why we have a programme to identify and sell surplus land." Publication of the review came as a report from Age UK called for all new homes to be built to a lifetime homes standard, which means they can be easily adapted as people age, by introducing things such as grab rails and level-access showers. Adapting a standard new house design costs about £1,500 extra at the building stage, government research shows. 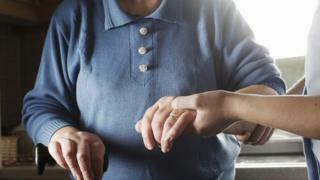 The charity said action was needed as thousands of older people face delays in being discharged from hospital because they are waiting for home adaptations that are harder to do in older properties. Age UK charity director Caroline Abrahams said: "Ensuring all new housing can be easily adapted would save the country millions and help end the nonsense of older people lingering for long periods in hospital, simply because of delays in fitting adaptations like grab rails and ramps."